I am cosy and comfortable and making some sparkly cards right now. How did this happen you may ask?..... Well, I woke up at 6.30 this morning and decided I was going to make my cards after all. I had a clear idea and a plan. Hurrah! So what if I only had yellow and orange card left, and my christmas trees are pink. That's a nice combination! 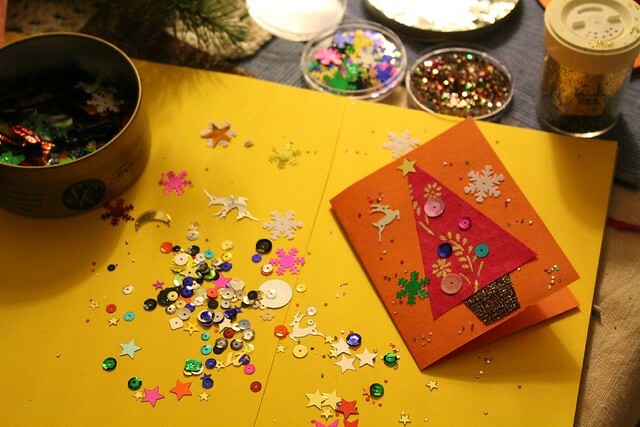 Anyone who has seen my usual cards in recent years knows it will probably be a little card made with whatever colour Indian paper I have, usually trees, because they're easy and I get to stick sparkly baubles all over them. They are always very child like, and they're always little, because little are best right. Oh the joys of sparkly sequin tin.......! It seems my resistance was futile. But I think I needed to move through that first. It needed to be heard you know. I think our 'no's' in life are important too. I think there are little messages in them, for us. PS: 2015 - the year of the Clear Out! Love them. They are so bright and cheery, like Christmas cards should be! Adorable, I love the reindeer sequin! They are a real delight.